Home › Barack Obama › Obama: I can’t save the Post Office I spent the money invading Syria on the DL. Obama: I can’t save the Post Office I spent the money invading Syria on the DL. Are you a liberal? Are you conservative? Are you independent? Are you aware that the United States President is now openly supporting an invasion of Syria? How do you feel about that? Did you vote for Barack Obama in 2008? Will you vote for him again this November? Do you think the tide has turned against his re-election campaign? Can you believe what happened when I painted VOTE OBAMA on a post in a largely democratic area? Do you work at the post Office or know anyone who does? Do you think taxpayer money should be spent domestically or over seas invading countries on the other side of the planet? When will trendies speak up about Barack Obama and his warmongering ways? Have you heard the latest report from Reuters that Obama is now setting aside millions of tax-payer dollars to support Syrian rebels? 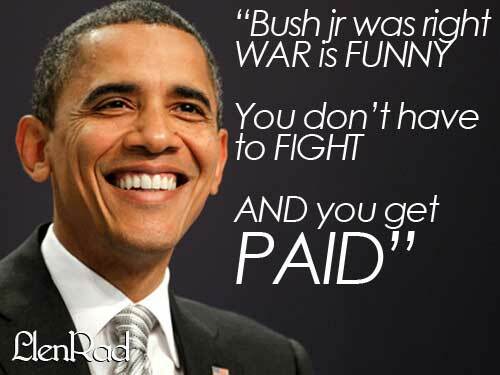 That’s right he’s not spending money on JOBS he’s spending money on wars. If I punched you in the face and I called it a love tap would you believe me? A rose by any other name is still a rose isn’t it? Or did that rule also change after 9/11? Or maybe if I punched you in the face enough times you would agree it is a love tap, that is more like what is happening here. I think people should consider paying attention to what their eyes are showing them instead of enjoying being brainwashed. The truth is obvious and right in front of your face. Obama is Bush 2.0 or iBush 2 or something. People said that they would hold Obama accountable if he carried out the same policies as George W Bush. What do you call providing military arms and cash to people invading another country? What if for example CUBA gave some MEXICANS money to invade TEXAS? Would they be called REBELS or TERRORISTS? Why are we calling these people invading SYRIA rebels? Meanwhile back at the ranch we call America. Cities are in shambles and even the Post office is behind on its payments and has defaulted on its debt obligation. The United States was supposed to be waging a global war on TERRORISM but now it appears TERRORISM is being used as a GO-TO technique to gain whatever it is Obama wants from Syria. They claim to be protecting the “rights” of the Syrian people but from the looks of things America has plenty of those problems at home. Who will protect the people here who are getting attacked for protesting? Just last week police shot an unarmed man in the back in Anaheim California then they attacked the crowd AND press when they gathered to document what happened and protest. Why are these stories happening more and more frequently? The United States has been spending way more than it takes in for years with no signs of slowing. I already said what the country should do to turn things around quickly. The chances of Obama doing that seem less and less likely. Obama seems to be using his power to force his desires on people. Instead of sending in the United States Marines he goes gangster style and invades Syria covertly. Like the innocent civilians who get killed won’t actually die or something? He will act like he isn’t responsible for their deaths though, that’s the sick part. Very few people know he did the same thing in Libya. What nation or person is next on Obama’s Kill list? Did you know Obama says he has an international license to Kill? What do you think? Is Obama worse than Bush because the trendies worship him?